I sometimes wonder if I write fantasy because I listen to folk music with its roots in legend and myth, or if it is the other way around. Whatever came first – the music or the fantasy – I do believe that one feeds the other, and music certainly plays an important part in my books. Well, with a debut novel called Song Quest, what did you expect me to say? Moving on ten years, and that blend of folk and Celtic music is still very much playing in the background to my work. Even though I don’t actually write to music (I need silence for the words to come out), songs definitely inspire me at the dreaming stage. I love the haunting music of Clannad, which is often used as a soundtrack in the kind of films I enjoy, and I especially love traditional ballads about fairyland, which is not as sweet or innocent a place as most children’s books would have you believe. It was one such ballad – The Elf Knight performed by Steeleye Span from their album Time – that provided the undercover soundtrack to my new Pendragon quartet about King Arthur’s daughter. Seven kings’ daughters have you slain here, but the eighth of them has slain you! 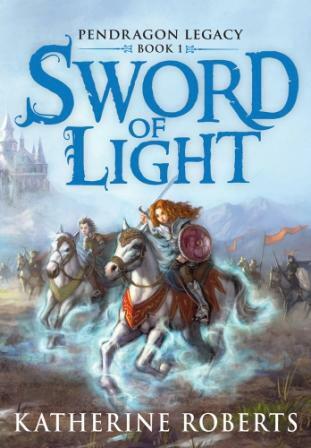 In Sword of Light my heroine Rhianna Pendragon has grown up on the enchanted isle of Avalon and is more than capable of turning the tables on any knight, fairy or mortal. But since she is a bit younger than the princess in the ballad, her elf-knight – Lord Avallach’s son, Prince Elphin –is her childhood friend and plays his enchanted harp to help Rhianna defeat her evil cousin Mordred, who has just killed King Arthur in battle at Camlann. Her spirit the purest of them all. Of course, with Prince Mordred’s greedy eyes on the throne of Camelot, the book also has plenty of battle scenes. For these, I turned to Maddy Prior’s album Lionhearts, which is set rather later than King Arthur in the time of Richard Lionheart and the Crusades, but has an atmospheric track War Games with a background of hoofbeats and the first line, which evoked for me a wonderful image of King Arthur’s knights riding out from Camelot into battle. So we come to a perfect example of writing feeding back into the music. I discovered Maddy had also produced an album called Arthur the King about a Dark Ages King Arthur, which perfectly fits with the setting for my books. I immediately ordered it, and am looking forward to listening to this new undercover soundtrack as I write the remaining three books in my Pendragon series: Lance of Truth, Crown of Dreams and Grail of Stars. Clannad have already helped inspire the plot of Book 2 with their album Magical Ring, and I have a feeling I’ll be listening to quite a lot of spiritual music for the final book, so if anyone can recommend a soundtrack to help Rhianna on the final stage of her quest for the Grail, I’d love to hear from you! This entry was posted on February 8, 2012, 12:24 am and is filed under My Memories of a Future Life, Undercover Soundtrack. You can follow any responses to this entry through RSS 2.0. You can leave a response, or trackback from your own site. Nice to have a girl involved in a historical fiction adventure! Interesting that folk music might have come first! Thanks, Laura! It was a lovely soundtrack to load up. Especially that Clannad song. For Arthurian inspiration, I really like Rick Wakeman’s Myths & Legends of King Arthur. It’s not folk, but it is done with real love for the setting. Terrific choice, Mr Disvan! I also favour Jethro Tull for some fairy action. Thank you Laura, yes Rhianna is fun to write about! And thank you Roz for all the links – you’ve found a version of The Elf-Knight I haven’t heard, the same ballad but with slight variations. That’s what I love about folk music, the way every artist makes it their own… the version in the link above is possibly more traditional, though Steeleye’s Span’s arrangement will always be the one in my head! My pleasure, Katherine! It was tricky to find examples of some of the songs – glad I found a suitable variation. How delightful that you wrote your own ballad, Katherine! Thanks for sharing your story. Very interesting that someone else does as I do. Only with a distinctly different genre. My Stage series is based on a band who plays Post Grunge with a Jazz twist. Most of my endearing scenes have been written along side songs like Alter Bridge’s Blackbird. I have a soft side, but I rarely venture beyond the music I know. I write my own, quite often, also. Several will be released, along side the Stage series when it starts it’s debut this summer, but I haven’t decided to include the songs as a separate single for down load after purchase or have the CD be available. Knowing me, it will be both. ‘A muse boost…’ absolutely. Several writers I know get so involved with the music of their worlds that they write their own – whether music features in the story or not. Sirkey, thanks for commenting and if you like this, we do it every week! I also recommend Gryphon, especially their first album. Ah yes, Jethro Tull – one of my all-time favourites, too! I’ll have to check out Gryphon… thank you mrdisvan. And I love that phrase “muse boost”…. my muse is a unicorn so I guess a “muse boost” must be a bit like riding on a unicorn’s back? I’m so happy I found this. 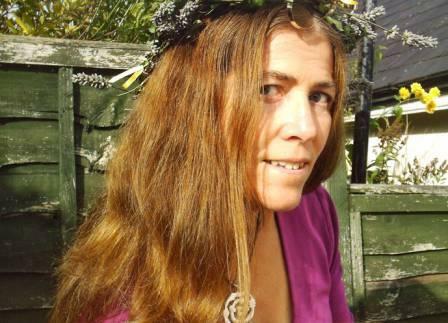 I grew up hearing Steeleye Span & I’m still searching for the mythical Song I Do Not Like. I was a very creative child, always writing poems & stories. I love fantasy novelsSince I found out Pegasus was something to do with creativity there’s pictures of him up. When I saw Steeleye live they were brilliant. When I didn’t listen to them – because at the age I was at the time, that just wasn’t done — I was really miserable & wrote nothing. Thanks, Claire – I love reading about the music that’s inspired people to write. Come back often! ?? When I met Maddy Prior after the gig I couldn’t speak. I agree with you about one feeding the other; the more I write, the more I want to listen to them. I luv blues too but that doesn’t seem to inspire me as much as they do. Have you ever read the Whitby series by Robin Jarvis?? There’s 3 of them; they’re YA books, but you’d luv them. I think the 3rd’s the best. It’s called ‘The Whitby Child’. Very hard to pick a favourite Steeleye Span song – they’re all so good! But I do love their Elf-Knight as mentioned above, and also the one about burning a witch, which I can’t remember the name of now but it’s quite gruesome! No, I haven’t read the Robin Jarvis series… though obviously I need to! They are all good. My stories are more like old-fashioned fairy tales, lots of mentions of gallows and blood and lovely enchanted songs! One of mine is even being used as therapy. I’d love a medieval looking book of them when I’ve done enough (they’re short) but I don’t know where/how to get them published or whether it’s worth doing so. It’s actually harder for me NOT to be creative than to just get on with it.